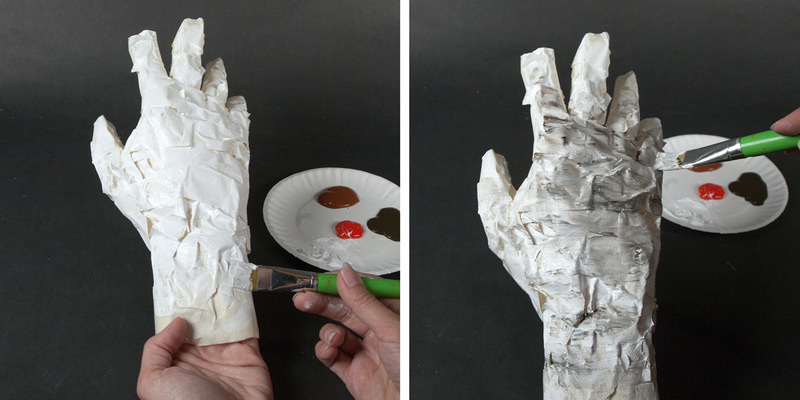 So now that you’ve mastered the art of the masking tape hand (instructions here), we want to show you how transform them into zombie hands. Scatter a few of these spooky props around the graveyard in your lawn and the neighbors will start gathering supplies for the zombie apocalypse. Gather your materials together and help the dead rise from their earthen graves! Step 1. Paint your masking tape hand white. Step 2. While the white paint is still wet, use a large brush to add dark brown paint. It will mix with the white paint to create a dirty look. Keep your brush strokes in a horizontal motion around the wrist and fingers. Let dry 15-20 min or until mostly dry to the touch. Step 3. Prepare the hand for adding fingers by cutting some of the finger tips shorter. Cut apart the thumb, as shown. Step 6. Insert the severed thumb into the thumb spot of the hand. Press the thumb into the hand until it looks proportionate. You can add a little tape as needed to keep the thumb in place. Step 7. Insert the rest of the fingers, one by one. When they are all tapped into place, cut the masking tape away in different areas to expose the fingers and look like ripped bandages. Step 8. 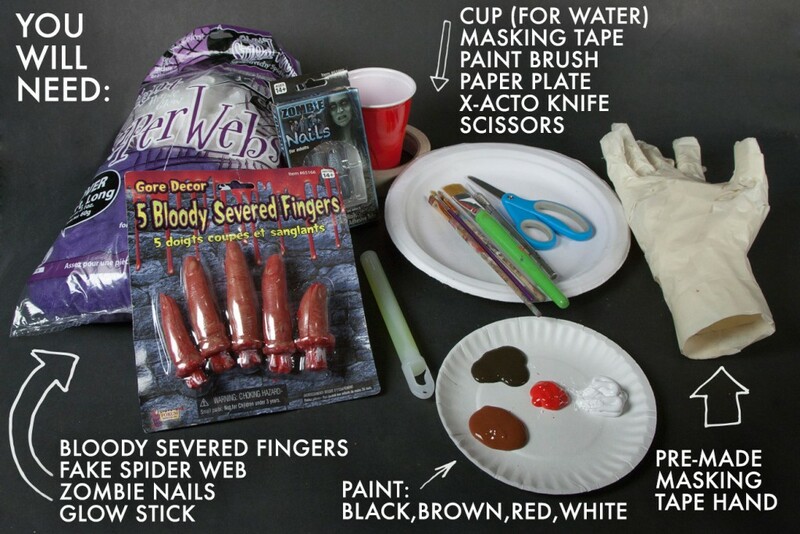 Apply the zombie nails to the severed fingers using the adhesive provided in the packaging. Step 9. Paint on blood drips and touch up any areas that were taped and let the hand dry. Step 10. Using the craft knife cut a hole in the paper plate, big enough to place the wrist of the hand through (You can trace the bottom of the hand on the plate as a guide). Step 11. Turn the plate upside down and push the hand through the opening, leaving about an inch of the wrist under the plate. Step 12. Cut slits in the bottom of the wrist to the plate, about 1 inch apart. Step 13. Fold the cut tabs back, and tape to the plate. This will secure the hand to the plate so that the hand will stand up on its own. Step 14. Paint the plate with the light and dark brown. Step 15. Once the brown paint is mostly dry, wrap the plate and hand with some spider webs and spiders. 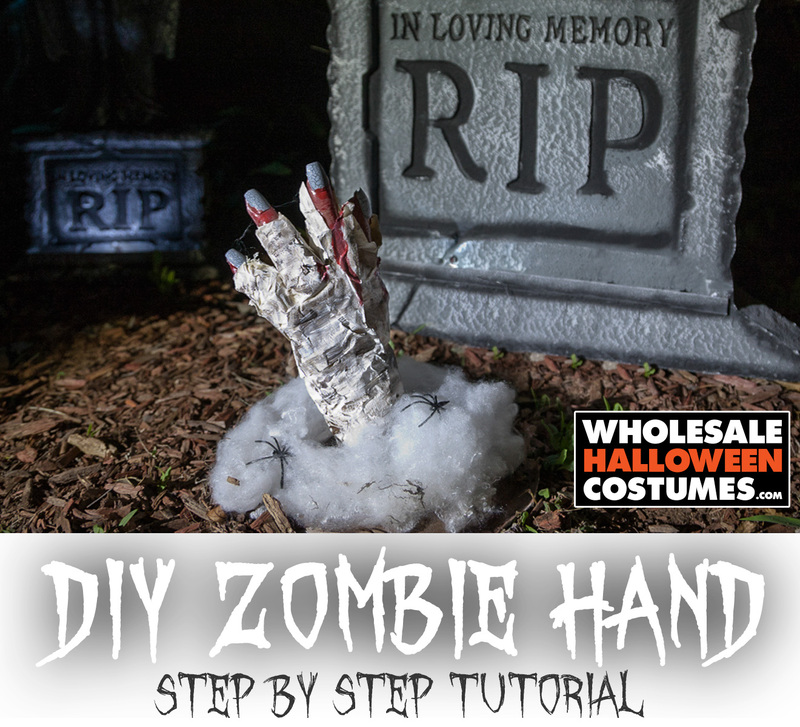 Display the hand as a centerpiece or place it next to a tombstone when decorating your yard Halloween night. 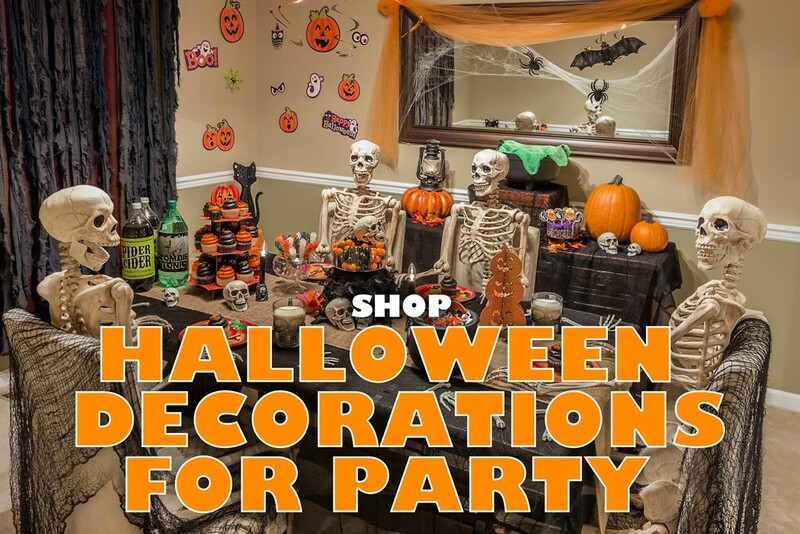 Pick up supplies for this DIY plus other party and home decorations in our store, and awaken the corpses on Halloween! 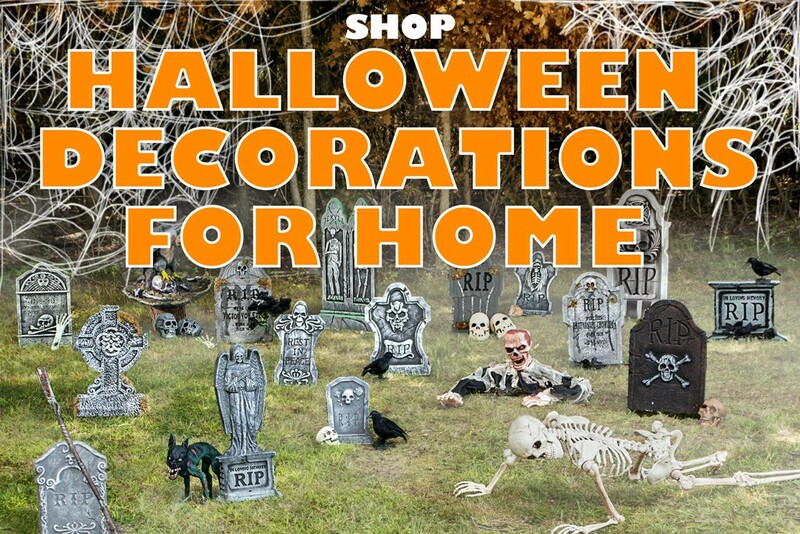 Looking for the perfect outfit to match your deadly decorations? Browse our wicked costume selection. Here’s our pinnable quick guide for this DIY project.